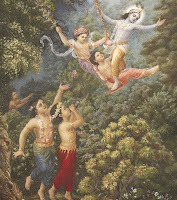 Krishna's Month Back Again After Two and a Half years! ~ The Toronto Hare Krishna Temple! Krishna's Month Back Again After Two and a Half years! As many regular spiritualists of the Hare Krishna tradition know, Krishna's month or the Purushottama Adhik Mas is back this year after two and a half years! This special month is inserted into the lunar calendar to help the lunar months coincide with the solar year. An extra month called Purushottama Adhik Mas, is inserted every 30 months (every 2 ½ years). Purushottama, is another name for Lord Krishna, Adhik means extra and mas means month. Lord Krishna presents different opportunities for us to get closer to him and this is a special time for sincere spiritualists to increase their spiritual strength and draw closer to Krishna. To read more about Krishna's month or the Purushottama Adhik Mas, click here!